Air Fried Beef Satay | Beef Satay Made Easy In Your Air Fryer! Air Fried Beef Satay is a super fast, very authentic recipe that requires very little hands-on time. Marinate the meat, walk away, cook for 10 minutes and eat. See how easy it to make beef satay in an oven or air fryer. 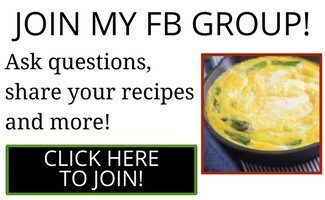 So I have worked hard to make recipes that require very little work time. At the most, I want you to spend 10-15 minutes getting the meat ready and 10-15 minutes cooking. The way to make this work, however, is to plan to marinade the meat for at least 30 minutes in between. So you could do this the night before while the rest of your dinner cooks, and have it ready and marinated for dinner the next day. Or you could get your side dishes ready while the meat cooks. 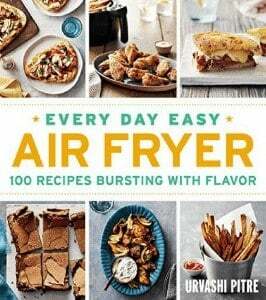 But if you like meal planning, this is a great way to approach air fryer cooking. 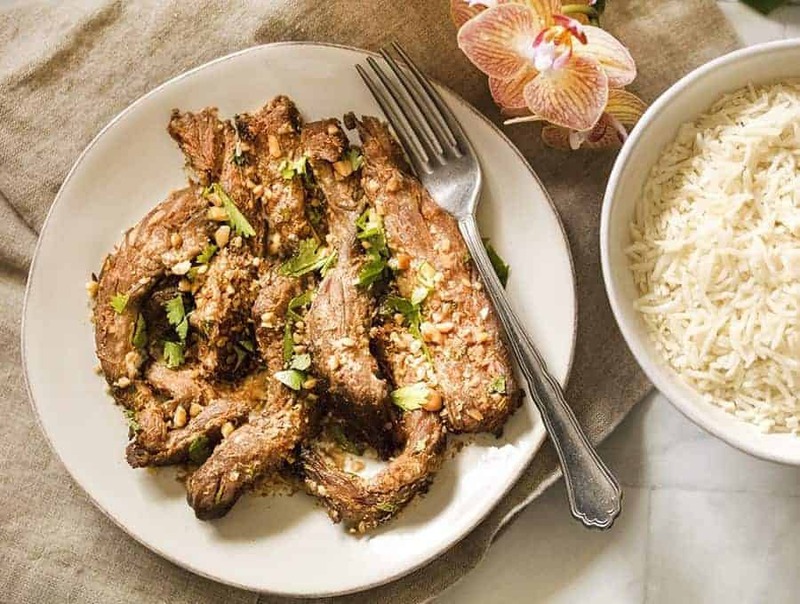 This Air Fried Beef Satay is one of those mix, marinade, and cook recipes that make dinnertime a breeze. 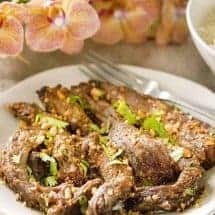 You can, of course, use this very same beef satay marinade to make chicken satay or pork satay. As long as you cut the meat up into bite-size chunks, you shouldn’t have a problem cooking it well all the way through. Be sure to leave as much of the marinade behind in the bag as you can so you don’t have a lot of white smoke coming out of your air fryer as you cook the meat. 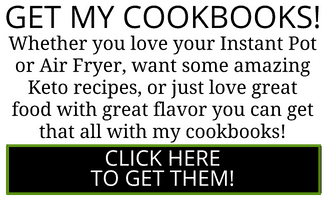 I wrote this as an air fryer recipe, but you can also grill this outside if you prefer. You might also like my Turkish Chicken Tavuk Shish recipe, as well as a Vietnamese Thit Nuong recipe for the air fryer. I would also make my peanut dipping sauce to go with this beef satay. I could just about drink that sauce plain anyway, so these beef satays give me a great excuse to guzzle some of it. 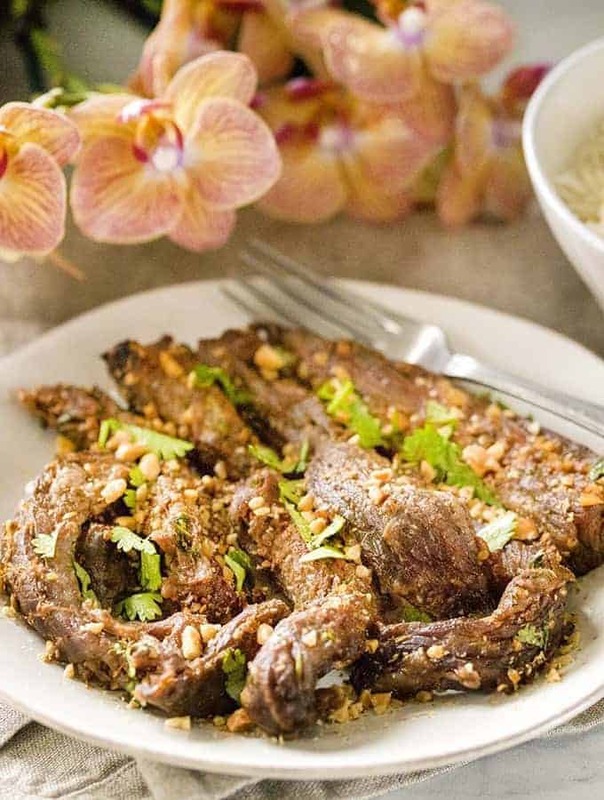 Air fried Beef Satay is a super fast, authentic recipe that requires very little hands-on time! Marinate the meat, walk away, cook for 10 minutes and eat. 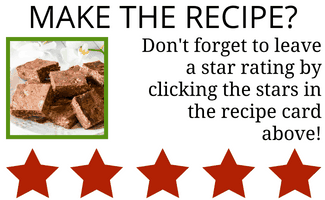 Place beef strips into a large bowl or a ziplock bag. Add oil, fish sauce, soy sauce, ginger, garlic, sugar, Sriracha, coriander, and 1/4 cup cilantro to the beef and mix well. Marinate for 30 minutes or up to 24 hours in the refrigerator. Using a set of tongs, place the beef strips in the air fryer basket, laying them side by side and minimizing overlap. Leave behind as much of the marinade as you can and discard this marinade. Set your air fryer to 400F for 8 minutes, flipping once halfway. Remove the meat to a serving tray, top with remaining 1/4 cup chopped cilantro and the chopped roasted peanuts. Serve with Easy Peanut Sauce.